The magazine Diverse: Issues in Higher Education has named UC Merced professor Ala Qattawi an Emerging Scholar of the Year in its first issue of 2017. 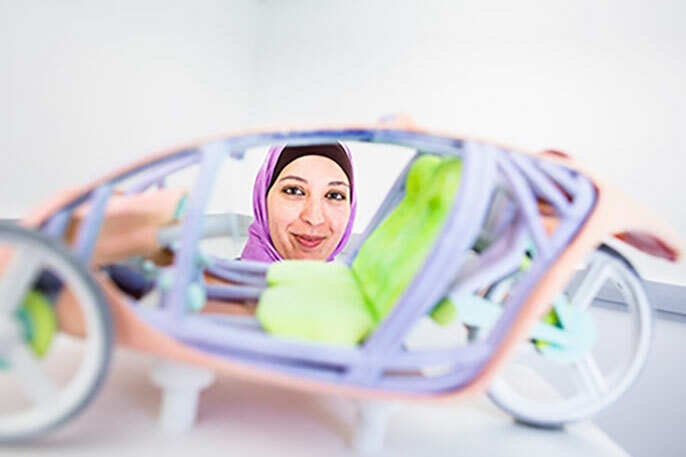 Qattawi, with the School of Engineering, is the first woman in the United States to earn a Ph.D. in automotive engineering, and the only automotive engineering professor at UC Merced. Qattawi joined the campus in 2015, after earning her degree at Clemson University. She studies innovative manufacturing processes for sheet metal so that car manufacturers don’t have to change expensive molds each time they make a new model. One way to do that is by folding the sheet metal origami-style. One of the aspects of working at UC Merced she most enjoys is working with students. “The undergraduates are really excited to work in research,” said Qattawi, who is an instructor in the senior capstone engineering courses. She and her students work on 3-D printing and materials studies, examining methods of folding sheet metal and assuring it can bear the weight of the function it serves in the car. Qattawi has introduced new courses in the fields of manufacturing processes and mechanical component design. She is also a mentor for female students and women of color, and organizes and participates in activities and seminars for women in science, technology, engineering and math (STEM) fields, to encourage more women to pursue STEM degrees. She said the more female mentors there are for STEM students, the more it becomes normal to have women in those fields. She’s working on an outreach program for younger students to teach them about 3-D printing. Qattawi was also named a recipient of a grant through the University of California Institute for Mexico and the United States (UC MEXUS) and El Consejo Nacional de Ciencia y Tecnología (CONACYT) program that supports teams of UC and Mexican researchers in basic and applied collaborative research, instructional development, and public service and education projects that apply to public issues. She and her fellow researcher from Mexico are working to characterize nickel-based alloy components. Qattawi was also named a Hellman Fellow for 2016, along with fellow professors Dalia Magana, Gregory Wright, Mariaelena Gonzalez, Venkattraman Ayyaswamy, Ramedra Saha, Shilpa Khatri and Emily Moran. The fellowship program supports promising junior faculty members as they work to establish themselves. And if she wasn’t busy enough, Qattawi is also involved with the Society of Automotive Engineers (SAE) student chapter at UC Merced. She helped shape the club from scratch, providing on-site feedback on students’ designs and activities. The SAE student chapter at UC Merced is thriving and is scheduled to participate in the 2017 SAE Formula competition with an electrical-car configuration.